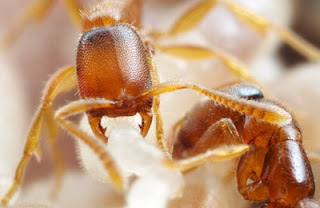 These tiny, wasp-like tropical ants primarily hunt large, venomous centipedes, attacking the many-legged killers in swarms and dragging their remains back to the nest. The adults, however, aren’t eating the centipedes they catch, but chewing them up as food for the grub-like, helpless ant larvae. So what do the adults eat? The blood of those same larvae, cutting them open and drinking just enough bodily fluids for their baby sisters to recover. Though it doesn’t kill them, the larvae do seem to panic and struggle when they sense a hungry grown-up coming.